The Panther was a tank fielded by Germany in World War II that served from mid-1943 to the end of the European war in 1945. It was intended as a counter to the T-34, and to replace the Panzer IV and III, though it served along with them and the heavy tanks until the end of the war. The Panther's excellent combination of firepower, mobility, and protection served as a benchmark for other nations' late war and immediate post-war tank designs and it is frequently regarded (along with the Soviet T-34 Tank) as the best tank design of World War II. Until 1944 it was designated as the Panzerkampfwagen VPanther and had the Ordnance inventory designation of Sd.Kfz. 171. On 27 February 1944,Hitler ordered that the Roman numeral V be deleted from the tank's designation. Despite being technically superior in most aspects to the tanks of other nations, the over burdened automotive portion of the design and lack of general reliability lessened its impact on the battlefield. Combine that with the low production rate compared to the Sherman and T-34 and one can easily see that numbers will end up winning the day. Of all the Panthers lost in combat, some estimates suggest that nearly half were due to mechanical breakdowns. 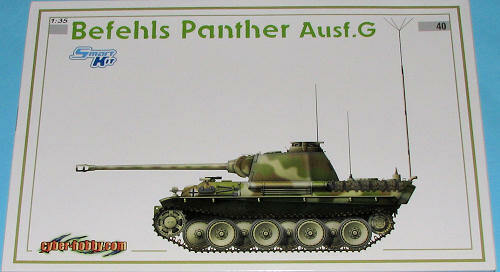 The Panther G was one of the last types to be produced. It incorporated a number of improvements, mostly in terms of reliability, but also additional armor. The Befehls version was a radio command tank and so had extra communications antennas and radios. This is another of Cyber-Hobby's wonderful limited run kits that is based on a variant for which few were built. In fact, this kit's markings options are for an 'unidentified unit in 1945 with little more than insignia to distinguish it, though the camo scheme is cool. 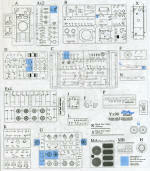 It is one of those 'many hundreds of parts' kits that will keep the builder engaged for a very long time. The kit has a ton of features so I'll let the Dragon PR people tell you about them so I won't miss anything. Lots of stuff, eh. I particularly like the positionable suspension and the Magic Tracks to allow a more dynamic display. 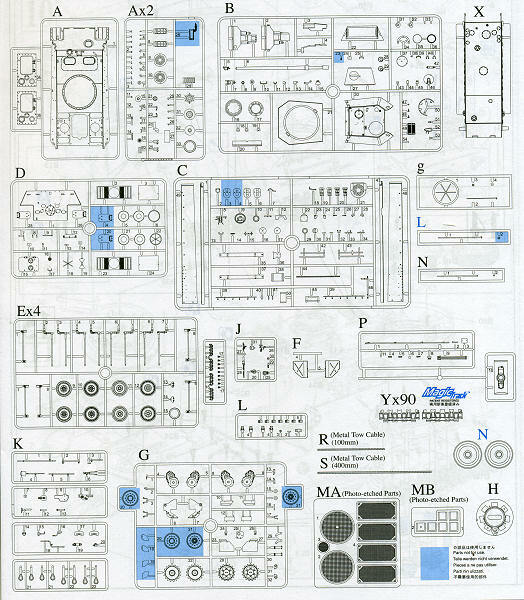 Instructions are at Cyber-hobby's usual high standards with clearly drawn illustrations and lots of notes. Another great kit of an interesting and unusual variant. This is one of their limited release kits so you may want to pick one up before they are gone.